Being an angler, I like hanging out at Cabela's website quite a bit. And being cheap, I especially like frequenting the Cabela's Bargain Cave (their outlet). 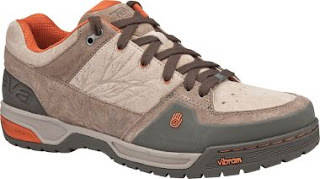 I saw these Teva B-1 hiking shoes in the Bargain Cave the other night and...well...they got me by the credit card. Note: I'm a sneaker whore, so this was not a difficult achievement. Cabela's is selling them for $29.99 (MSRP $100.00) - while other websites are nowhere close. Most are actually selling them anywhere from $55 to $99 - (King of internet shoe stores) Zappos included. So will they actually fit when I get them? Who knows. Guess that's always a risk of buying footwear online. But I thought I'd pass it along if anyone's looking for a new pair of light-duty hikers to take on your local trails this fall. For 29 bucks, you can buy a couple pairs, throw one in the trunk, and when rock hopping a stream and get soaked, a nice dry pair awaits. Vibram soles for $29...! Simms and others are you paying attention? Thanks, Michael, I am going to look at these also. Thanks for the tip to what looks like a great deal. I too spend a lot of time going through Cabela's and like to browse the cave, that is a very nice deal. Thanks all. They shipped on Friday so I should get them this week. If they're good I'll mention it in a post (and probably buy another for a situation like Brk Trt brought up).